The arrival of spring always brings an influx of eggs. Eggs are an essential part of the Passover meal 鈥� often hard-boiled for Ashkenazi tables, or served haminados (or baked) at Sephardic ones. 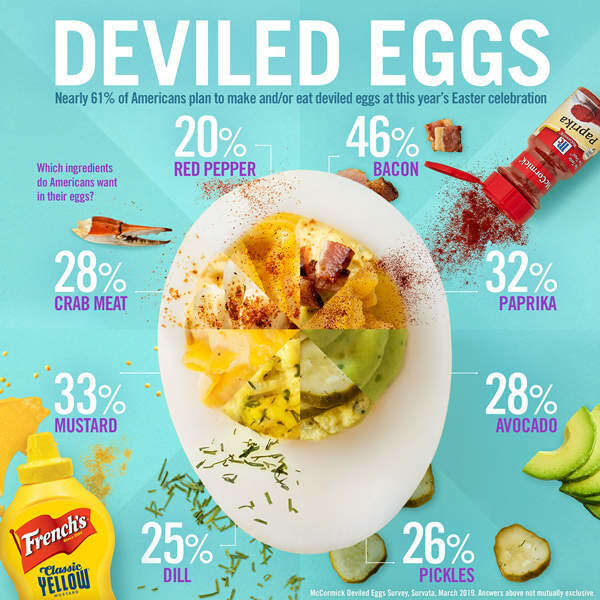 And at Easter, besides the popular dyed eggs for your egg hunt, a recent survey sponsored by McCormick & Company found that 61 percent of people serve their eggs deviled for the holiday meal. The spice company also used their survey to find out what, exactly, people wanted to put on their deviled eggs 鈥� because half the fun of the dish is getting to put your own fancy spin on them before you show them off to guests. First, they asked a few chefs to do up some eggs for them: Hugh Acheson made them with pimento cheese, Gavin Kaysen used smoked trout, and Alex Guarnaschelli added fiery bacon. Rick Bayless stayed on-brand with creamy jalape帽os, and Timothy Hollingsworth made his with pickled onions. Then they asked the public what they would want on their deviled eggs. Turns out, Guarnaschelli was on the right track: Almost half of Americans (46 percent) said they wanted to add bacon to their deviled eggs. The next two favorites (with 33 and 32 percent, respectively) were the classics: mustard and paprika. But not far behind them, things got interesting: Twenty-eight percent of people wanted to try crabmeat and avocado (and frankly both together sounds amazing), and 26 percent wanted to try pickles. Twenty-five percent would opt for dill, and only 20 percent thought red pepper sounded good. The fun thing about deviled eggs, though, is you don鈥檛 even have to pick 鈥� once you鈥檝e made the eggs and the filling, you can experiment with various proteins, vegetables, spices, and whatever else you might have on hand in small batches. 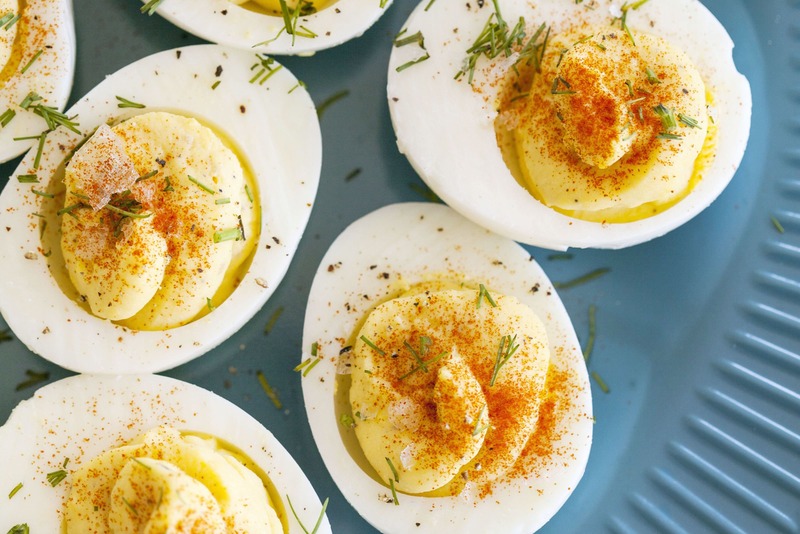 You could even do a fill-your-own deviled egg bar for Easter brunch.